And when it comes to raising standards, Blanche knows what she’s talking about. Under her leadership Atlassian was able to boost its female technical hires by 80% — and they haven’t stopped there. In 2017, one third of Atlassian’s technical interns were Black or Latinx. The company also saw a 25% increase over the last two years in employees over the age of 40. A full 13.1% of Atlassian’s technical employees now identify as members of underrepresented racial and ethnic groups. And the company has been able to maintain its representation of people of color across the organization as it has nearly tripled in size. But Blanche is on a mission to raise the bar for D&I not only at Atlassian, but across the tech industry as a whole, challenging leaders and teams everywhere to step up their game. Inspired by her talk at First Round’s Founders Summit, here she shares Atlassian’s playbook for making meaningful advances on D&I, highlighting the challenges in this evolving field and walking through eight specific strategies for startups looking to join her at that higher bar. For the past several years, D&I has been a hot topic of conversation in the tech world. From the #FoundersForChange and #MeToo movements to the discussions around pay equity and the slew of corporate diversity reports coming out, it’s front and center in the industry’s spotlight. That same Atlassian report found that D&I efforts have stalled. There was an almost 50% decrease in individual participation in diversity initiatives year-over-year. Meanwhile, adoption of company-wide initiatives in the US stayed flat, while Silicon Valley companies actually registered fewer formal D&I programs than last year. Meanwhile, less than 30% of underrepresented groups reported having a sense of belonging, representation and high levels of retention at their respective companies. Overwhelmed by complexity. The sheer number of issues that need to be addressed is daunting. From sexism and racism to ableism and ageism, the fight for D&I is a battle on many fronts. Matters can be complicated further by internal disagreements over what to focus on. “Trying to address them all at once is obviously not a recipe for success, but people don’t know where to start. And the feeling that you can’t make an impact as just one person or one company can lead you to stop taking action altogether,” she says. Caring without action isn't caring. It’s complicity in lowering the bar. For startups looking to move past simply talking about D&I, here are eight strategies from Blanche’s experiences at Atlassian to help make sure caring deeply is coupled with acting quickly. You can’t have a cookie-cutter approach to D&I, it’s not a one-size-fits-all situation. Mapping your privilege means recognizing that talent and potential are equally distributed, but opportunity is not. Instead, start talking about axes of diversity that move past gender. It’s a great way to turn what could be an “us versus them” conversation into a discussion about “we,” where everyone feels included. This is why Blanche spends a lot of her time talking about intersectionality and the importance of highlighting invisible or layered identities. A lack of diversity often stems from the inherent bias that lurks within a startup’s recruiting process. By improving the tools to identify it and mitigate it, leaders can make more progress on the quest to stamp it out. Recognize that unconscious bias requires mitigation, not just training. Don’t pay some fancy consultant to do unconscious bias training if you think it will fix people's brains. That’s not how neuroscience works. Take the time, not the easy shortcut. Spot skills in non-linear experiences. But even with the right recruiting tools and interview system in place, it’s all meaningless if underrepresented candidates aren’t applying to open jobs in the first place. This is something Blanche ran up against at Atlassian. Spell out your commitment to fair hiring practices. Blanche is an evangelist for Textio, the augmented writing platform that gives real time feedback about both the gender balance as well as the overall impact of job ads. And the tool’s data shows that job listings with strong equal opportunity language fill 10% faster on average across all demographic groups. Certain words and tired phrases have become so embedded in tech jargon that they’ve lost all meaning. But they can also send up red flags. Get creative (and do some gentle stalking). “I’m forever reminding people that I have an ampersand in my title,” Blanche says. “Tech companies put out diversity reports, not inclusion or belonging reports. And that’s because subjective feelings like belonging seem harder to measure. People like to focus on diversity because there’s numbers and spreadsheets — things people are comfortable with. They’re less comfortable with the more squishy notions around what it means to feel like you belong,” she says. 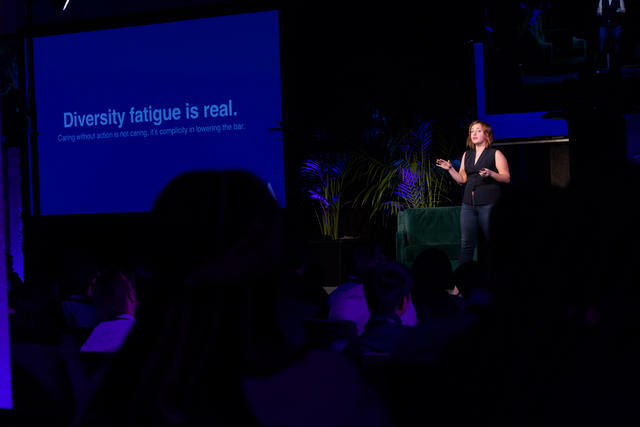 With Blanche’s leadership and significant investment from teams across the company, Atlassian has been able to raise the bar for D&I by fighting back against fatigue and taking action to turn goodwill into real results. For the startup looking to follow in their footsteps, first identify the unique and aspirational “why” that drives your own D&I efforts. Next, start experimenting with small tweaks, such as adjusting the end-of-year review process flow. Encourage everyone on your team to take on the hard work of mapping their privilege and start slicing data at the team level for deeper insights. Be sure to embrace intersectionality by highlighting hidden identities. Consider redesigning your recruiting to mitigate unconscious bias and optimize for experiences, not just skills or filling the role quickly. Fine tune your messaging to remove cliches, emphasize equal opportunity and get creative with outreach to underrepresented communities. Finally, make sure you don’t forget about belonging. Find new ways to measure it and focus on retaining the underrepresented individuals you already have.